This area involves all design and execution processes, including previous studies and large infrastructures project elaboration: dual carriageways, roads, railways, traffic studies, etc. Also, it develops all the usual activities related to water in the civil engineering field: projects, studies, reports, physical-mathematical behaviour models, etc. The latter is an important chapter which carries out simulation models of the hydrological and hydraulic behaviour in the development of studies and projects for resources management, channelling, reservoirs, etc. The company designates on-site technical assistance teams in order to keep a direct follow-up of the works. These teams, in coordination with the general services of the headquarters, resolve all technical and management aspects. 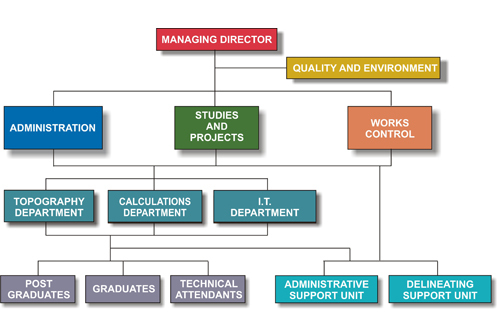 For a correct and effective assistance a close coordination with the Study and Projects Area is established, so that the latter can contribute with knowledge and know-how in the technical and management works related with these areas. Copyright © Agrupación Mediterránea de Ingeniería, S. A.